As I listen to "Flume" by Bon Iver, I recall an old friend of mine telling me that he thought the man behind Bon Iver, Justin Vernon, writes lyrics that don't exactly make sense at all - that just sound good with the music and melody. I find this funny and ironic as I now listen to this song. I actually have fallen in love with Bon Iver and the romantic, tender feeling of his music. It's lovely for late nights, with the rain falling softly outside. Which is what I'm doing now. I spent the afternoon and evening with Nathaniel and we took these photos before the rain came... luckily I got some photos of this skirt, finally. It is part of the Secondhand Swap that I mentioned a bit ago - started by Lily of Love Charles Vintage. This skirt was sent to me along with this top from Rachel of Mousevox, who is also part of the swap. It's about time I send both pieces onto the next girl! It's been a bit too long, haha. We browsed Goodwill for a bit, then got some pizza and spent the remainder of the night playing Sly Cooper, a pretty awesome PS2 game about a thieving raccoon. A crazy evening if you ask me. ;) We sure know how to party on a Saturday night! Your photos are so beating! 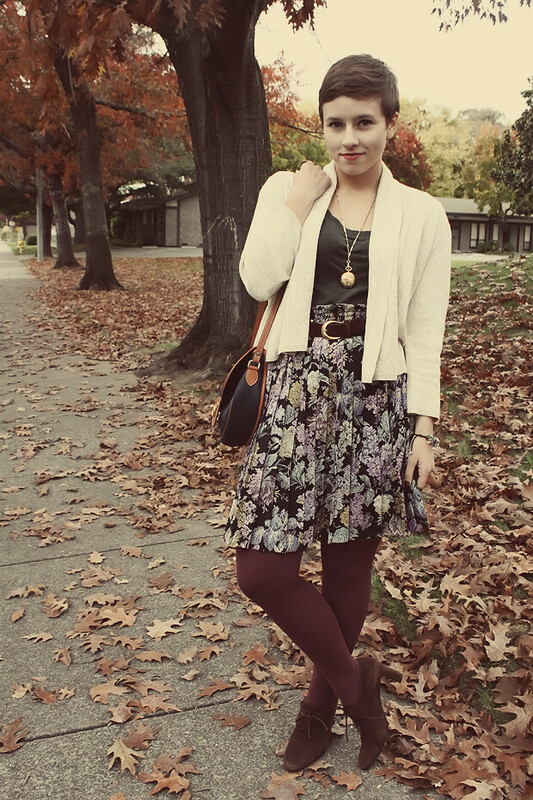 I love everything about this outfit especially the lovely lighting and the dreamy autumn feel. Gorgeous post! Just beautiful as always Miss. Elanor! 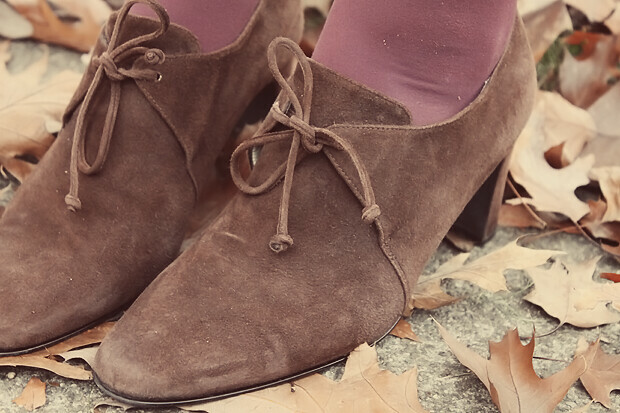 I especially love your maroon tights...I've been searching for a pair like them, as well! I really liked your skirt too! 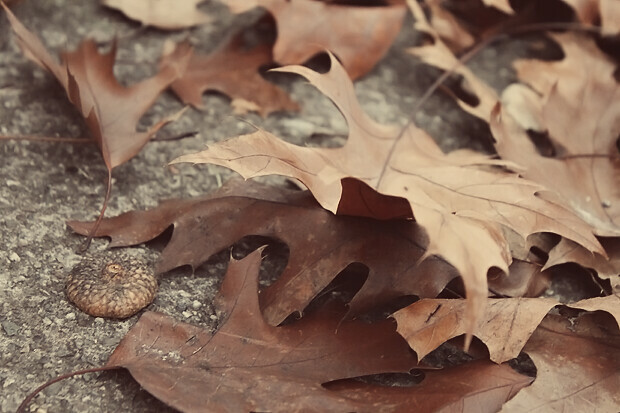 The Autumn feeling is really adorable! I'm a fan of Bon Iver as well, beautiful music definitely. 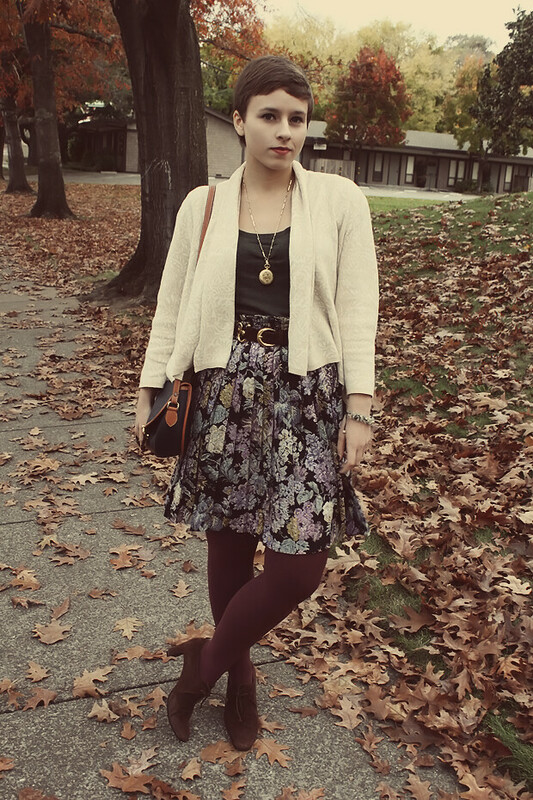 Your skirt is beautiful and I love the top and tights you paired with it. So elegant. Your hair is insanely beautiful. Oh blogger swaps are the best! 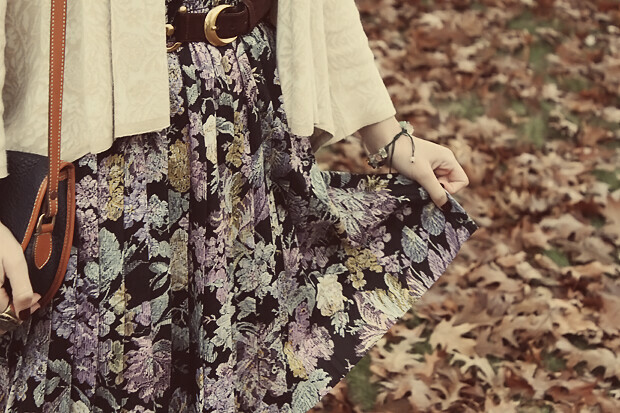 that skirt print is so lovely! i love bon iver. i got to see him a couple years ago in oakland at the fox theater, and it was amazing. he commanded the entire audience to shut up, and they did (a rare thing) and got us all to sing along to wolves. i love this outfit-it's most likely my favorite!! Great look ! I love your hair ! oooh, it looks so cute on you! i love how you styled both pieces. xo.